In the last year and a half, and even before that, I have experimented with pizza. Loads of pizza. I made pizza’s with a thick crust, a crispy crust, simple margarita versions, and pizza’s loaded with 749202924 toppings. I even made sweet potato pizza once, which is tasty, but it isn’t a classic pizza. Apart from trying various toppings, I also experimented with the crust a lot, and how to bake it the best. I currently live in a teensy tiny studio of about 17 square meters, and my oven is one of those microwave-oven combinations. On the box it said it could go up to 230 degrees Celcius, but when I finally bought an oven thermometer (seriously, do it! So worth the money), I found out that mine wouldn’t get any hotter than approximately 190 to 200 degrees Celcius, even if I would let it heat up for 15 minutes or more. So, since pizza’s are normally baked in an oven that is as hot as possible on a hot pizza stone, I experimented with how to bake my pizza and make it as authentic as possible. I like both a crispy, Italian crust, and a thicker, American crust, but the instructions for this recipe are mainly focussed on getting a crispier crust. If you prefer a thicker crust I would suggest rolling out the dough to between 5 mm and 1 cm thickness. Apart from the crust, I also experimented with toppings. The most important thing is definitely less is more. The less toppings, and the lower the water content is in those toppings, the crispier your crust is going to be. 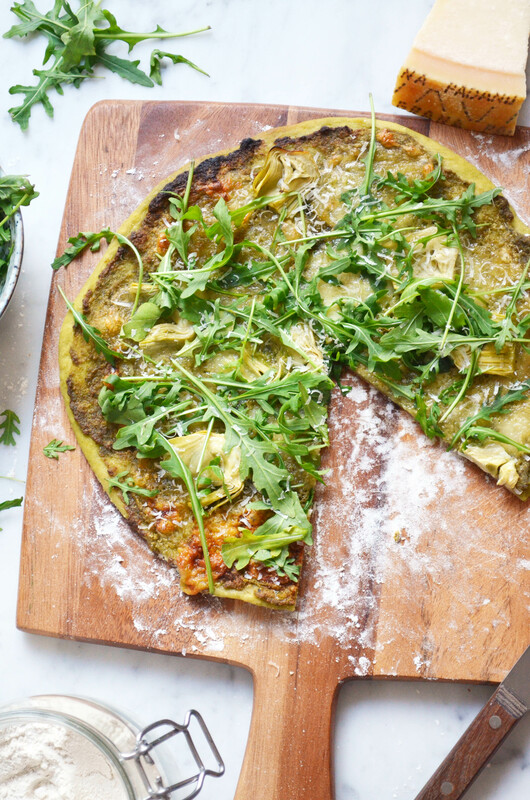 I love a pizza with loads of veggies, or with a classic red sauce, but in the end, this pizza verde has my heart. 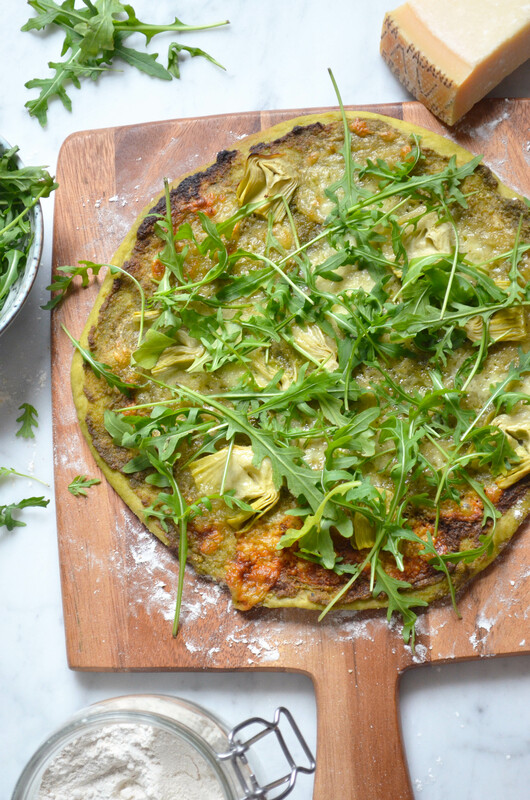 Homemade pesto, mozzarella and artichoke heart are the main part of this pizza, topped off with loads of arugula and parmesan cheese. Technically, real parmesan cheese isn’t vegetarian, because it is made with rennets rendered from animal stomachs, in this case a calf’s stomach. If you’ve been following me for a while, you probably know that I eat vegetarian, and even vegan most of the time. However, after a LOT of thought I have decided to be a strict vegetarian. I personally feel like balance is more important in my life right now than being super strict about what I do and don’t eat. Some of you might take this the wrong way, and I totally understand that. 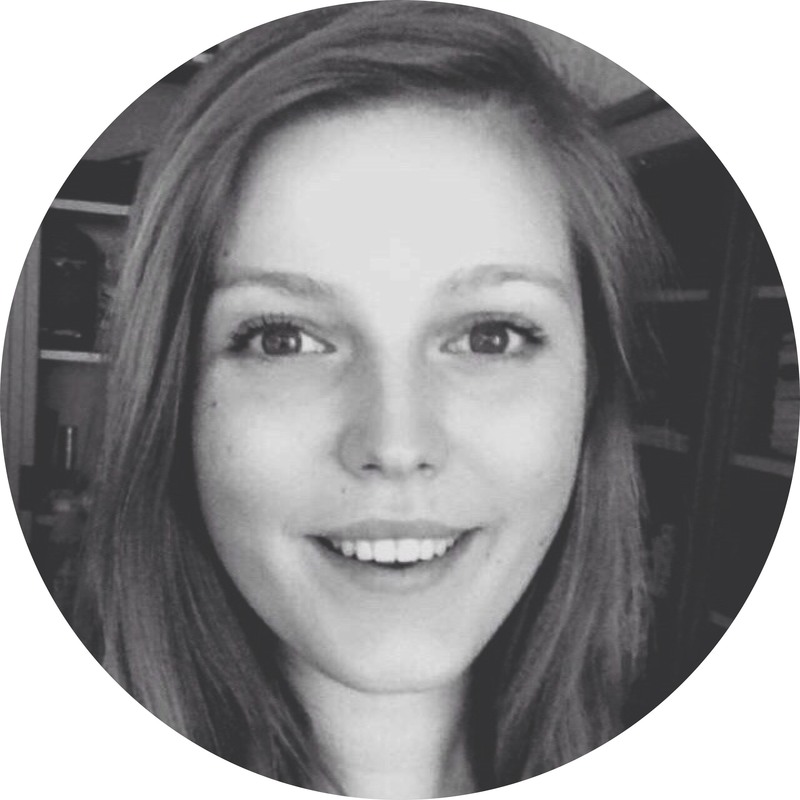 A plant-based diet is something that I’ve strived for for a long time, partly here on my blog, but also out there in the real world, and I can imagine that my decision might disappoint some of you. 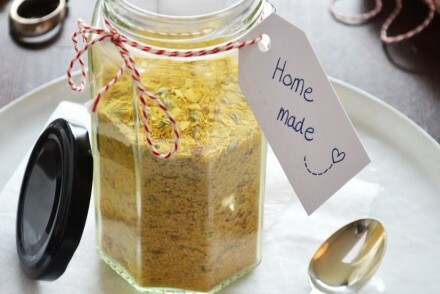 I will definitely most likely not share any meat or fish recipes on here, but you might see some more recipes with ingredients like parmesan, that might have some animal components and aren’t 100% vegetarian. I hope you guys understand, and of course, you can always just leave out the parmesan! In a big bowl, combine the flour and salt. In a separate mug, combine the yeast, sugar and water, and let rest for a few minutes, then pour it into the bowl with the flour and salt mixture and add the olive oil. First mix it with a spoon or fork, and then continue kneading it for a few minutes, but preferably around 10 minutes. Grease the bowl lightly and put the dough back in. Cover with bowl cling film and let rise for 45 minutes to 2 hours, until the dough has roughly doubled in size. Separate the dough into two, and dust a large surface with some flour. Take one of the two dough balls, and roll it out on the floured surface with the help of a floured rolling pin. If you want a crispy pizza, you’ll want to roll the dough out until you have a thickness of about 2 to 4 mm. Meanwhile, heat a pizza stone in your oven. If you don’t have one (like me), another thing that works well is a large metal sheet, like a cookie sheet. It has to be metal because you want it to be super hot. If you have your dough all rolled out, I would recommend putting it on a large piece of baking paper before you put any toppings on, because it will make it easier to transfer the pizza to the heated oven with your hot pizza stone/metal sheet. So, once you have a pizza stone/metal sheet in the oven to preheat, and you have your rolled out pizza dough on a piece of baking paper, it is time to top it! In this case, I used 3 to 5 tablespoons pesto per pizza (I love my homemade pesto for this), 4 artichoke hearts, one bulb of mozzarella, a little salt and pepper to taste and some parmesan cheese. 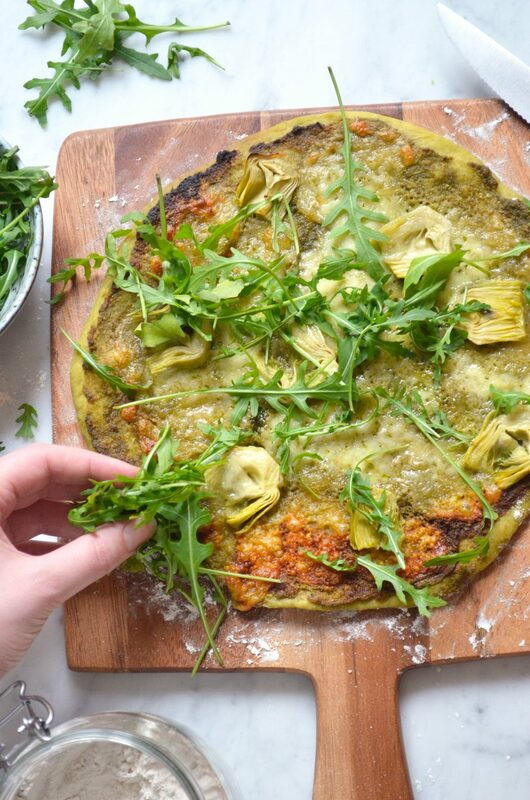 Don’t worry if your pizza looks a little boring, because we will top it off with some arugula once it is done. 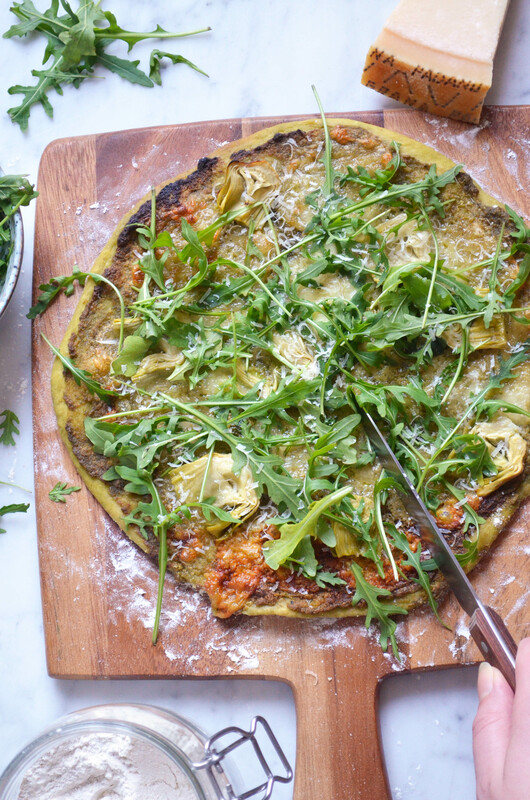 Don’t skip the arugula though, because it will totally take this pizza to the next level. Once your pizza is assembled, you will want to bake it for between 5 and 15 minutes, depending on how hot your oven is. The general rule is, the hotter your oven and the hotter your pizza stone/metal sheet is, the shorter time it will need in the oven. For my oven, and the hottest it will get is 180 degrees, I will bake my pizza’s for about 12 to 15 minutes. It is pretty long, but I also don’t mind if some of the sides get a little golden brown, because I live for that crisp baby! If your oven gets warmer than 180 degrees (check it with an oven thermometer), I would recommend the hottest setting and taking a look every other minute to make sure it doesn’t burn. 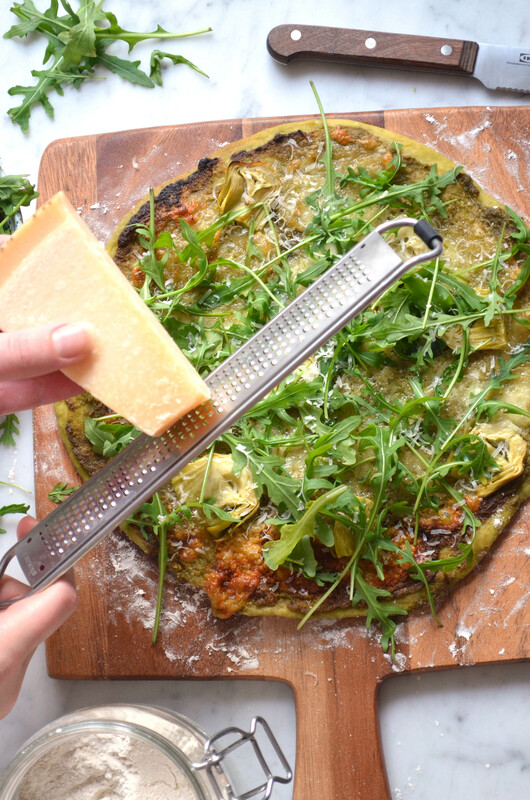 Once the pizza is done, take it out and let it cool for a minute or so before you put the arugula on, or the heat will wilt the arugula. Top with another grating of parmesan and maybe some more salt or pepper if you feel like your pizza needs it. Enjoy! PS: This recipe makes enough dough for two pizza’s, but the dough can be frozen for another time. Just wrap it in some cling film and then put it in a tupperware box to prevent it from drying out in the fridge. Let thaw completely before using.